Are you looking for a reliable lawn care service provider in your area? Call Olson's Lawnscape today at 906-399-1718 to schedule service or to get a free quote. Jonas Olson founded Olson’s Lawnscape in 2009. Growing up in the community, he understood that his friends and neighbors wanted more than “cut and run” lawn care and landscaping services. They wanted cost-efficient projects to boost their properties’ curb appeal and an increased quality of life as homeowners. Back in the day, he built his startup having the vision of providing the community with high-quality, reliable and consistent lawn care and landscaping services to cover all possible needs. 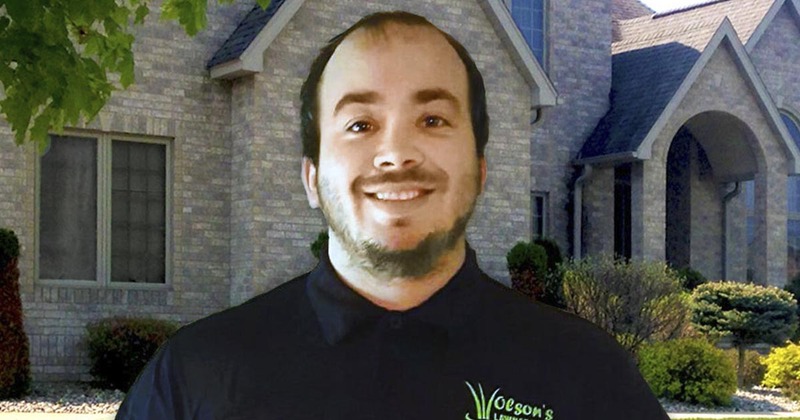 Since then, his company became a good practice model in the industry: the full range of services, the obsessive attention to detail, the high standards he set for the services and his team soon became the reasons why everybody chooses Olson’s Lawnscape instead of other similar contractors. What truly makes a difference between Olson’s and other companies is that we treat each property as if it was our own. After all, our clients are also our neighbors, friends and acquaintances. We know that if we fail to provide them with the best programs and pricing plans we ruin our reputation in the community. On the contrary, we want our customers to tell their friends and neighbors about us and help us establish even more mutually beneficial relationships with them. Being a family owned local company we are all too aware of the particular challenges of the area. We know everything about being responsible for your home, garden and family, we know the climate, the endemic species growing here, the pests that give us all some troubles, the strengths and problems each patch of land features all year long. In other words, we know our turf. We also know that people in our community don’t settle for less than they deserve. A thriving community like this one, with hard-working, entrepreneurial, and exigent people needs top-notch services delivered by top-notch professionals year-round. We are proud to say we have grown to be able to offer premium services no matter the properties’ sizes or budgets, because quality and clients’ satisfaction is our top priority. All our employees are licensed and certified in their fields of expertise, all our equipment is constantly upgraded and all our specialists benefit from constant training in horticulture, architecture, engineering or ecology. We don’t want to just meet your expectations, we want to exceed them. In a competitive business like this one and in a confusing economic landscape, we know that we can succeed only if we deliver perfection. We are so confident that you will love to work with us so much you will never need another contractor again that Jonas offers each client his personal iron-clad, risk-free guarantee. We want to take all the risks while you take none, this is why Jonas’s warranty stipulates that if you are not fully and totally satisfied with our work, he will personally make sure the problem is fixed at no extra cost. It doesn’t matter how big or small the problem is, you can call us back to redo the job for free. Jonas’s personal guarantee also stipulates that if you are still unhappy with the results, you don’t pay us at all! You can imagine that such a risk-free warranty is a terrific motivator for all of us to do our job above perfection, but as you can see, we are going very strong since 2009, meaning that few people were indeed unhappy with what we have done for them. Give us a call today at 906-399-1718 to request a free quote for lawn care services in Escanaba, Gladstone, Marquette, Iron Mountain, or Menominee Michigan.